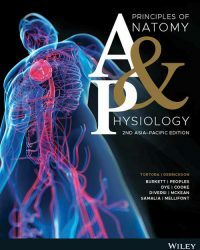 The second Asia-Pacific edition of Tortora’s Principles of Anatomy & Physiology, 2nd Asia-Pacific Edition combines exceptional content and outstanding visuals for a rich and comprehensive classroom experience. This text provides you with an accurate, clearly written and expertly illustrated presentation of the structure of the human body. It also offers insights into the connections between structure and function and explores the practical and relevant applications of anatomical knowledge to everyday life and career development. Available as a full colour printed textbook with an interactive eBook code, this title enables every introductory student to master concepts and succeed in assessment by taking the roadblocks out of self-study, with features that are designed to help you get the most out of what you’re learning. This edition includes enhanced and updated coverage and is complemented by features like animations and interactivities that are embedded at the point of learning to bring the theoretical to life, Concept Check questions that are placed at the end of every chapter to provide instant feedback and help find where your strengths and weaknesses lie in comprehension, and the opportunity to work between the online (interactive e-text) and offline (print) to cater to how you study best, with the ability to search, highlight and annotate within the text.